With a rich literary tradition, a thriving arts and music scene and remarkable architecture, Galway has a reputation of being one of Ireland’s cultural hotspots. The city’s history goes as far back as the Middle Ages, which is reflected in the architecture that surrounds you wherever you go in the city. But it’s not just the city that’s must-see; the surrounding area offers idyllic nature and historic castles as far as the eye can see. With so much to see, it’s worth joining a walking tour in the city to learn about the main attractions from the experts. Make sure you check out Galway City Museum, which contain countless excellent exhibitions spanning as far back as the area’s prehistoric past. Not far away is the Spanish Arch, an extension of the city wall dating back to 1580, while the St. Nicholas' Collegiate Church and Lynch's Castle are both excellent examples of Galway’s medieval architecture. Even outside Galway there’s plenty to see. Visit Kylemore Abbey with its magnificent gardens, or perhaps take a day-trip to the pretty town of Clifden. A 30-minute drive from Galway is the fabled Dunguaire Castle, a 16th Century tower house name after the legendary King of Connacht. When it comes to nightlife, only a few cities in the country can compete with Galway. Once the evening hits you will be spoiled for choice by the countless jazz bars, pubs, theatres, comedy clubs and other entertainment venues that crowd the city street. If you can, it’s worth booking your holiday to Galway during one of the many events that run throughout the year. In summer, there’s the Galway Races, Galway Cathedral Recitals and the Galway Arts Festival, to name but a few. Then the foodies come out to play for the Oyster Festival in September. Thanks to the Gulf Stream on the north Atlantic coast, Galway maintains a pretty continuous mild climate. In winter, the average temperature is a balmy 9°C, while the summer months (when most tourists come) offer a pretty pleasing average of 19°C. Who said Ireland was cold and wet? Tour one of Ireland's most romantic castles, which has been home to Benedictine nuns since 1920. Peruse the modern art and floral displays of this park that takes you away from the bustle of the city. See a fascinating mosaic of John F. Kennedy in a modern church he visited in Ireland. Admire its rose window and artworks. See a variety of relics that tell the story of the city from prehistoric times to present day in this museum near the River Corrib. Cruise around the scenic sights of Galway Bay, see the historic Spanish Arch, spot charmingly colorful houses and dine in restaurants with water views. 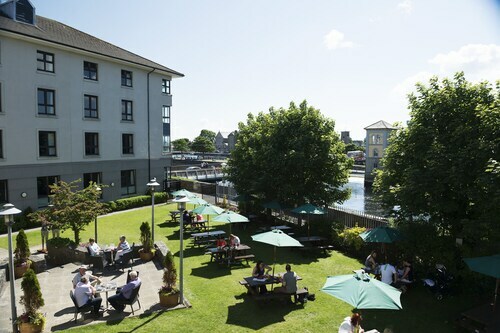 Located in Galway City Centre, this eco-friendly hotel is within a 10-minute walk of Galway City Museum and Eyre Square. National University of Ireland-Galway and University Hospital Galway are also within 1 mile (2 km). Galway Station is 11 minutes by foot. 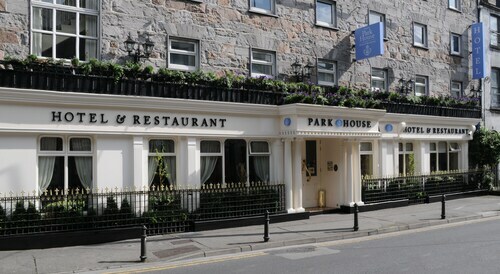 Located in Galway City Centre, this hotel is steps away from The Fountain and Eyre Square. National University of Ireland-Galway and University Hospital Galway are also within 1 mile (2 km). Galway Station is only a 2-minute walk. 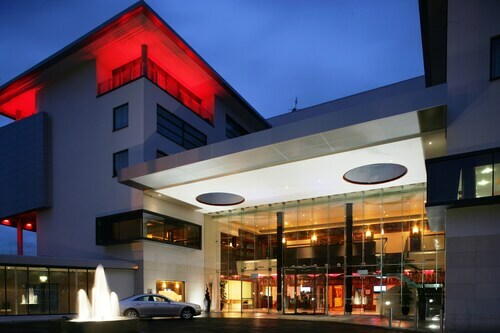 Situated near the airport, this hotel is 1.2 mi (1.9 km) from Galway Race Course and 3 mi (4.9 km) from Eyre Square. Galway Clinic Private Hospital and Cooper's Hill Livery are also within 2 miles (3 km). Located in Galway City Centre, this hotel is within 1 mi (2 km) of Galway Shopping Center and Eyre Square. National University of Ireland-Galway and University Hospital Galway are also within 2 miles (3 km). Galway Station is 22 minutes by foot. 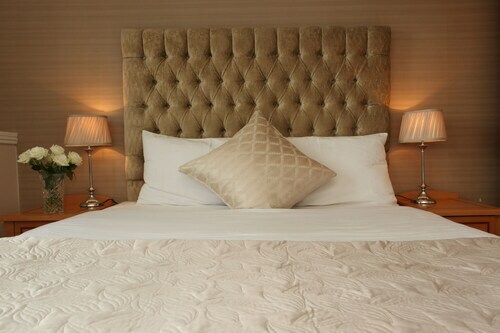 Located in the centre of Galway, this family-friendly hotel is within a 5-minute walk of Galway Tours and Eyre Square. National University of Ireland-Galway and University Hospital Galway are also within 1 mile (2 km). Galway Station is 5 minutes by foot. 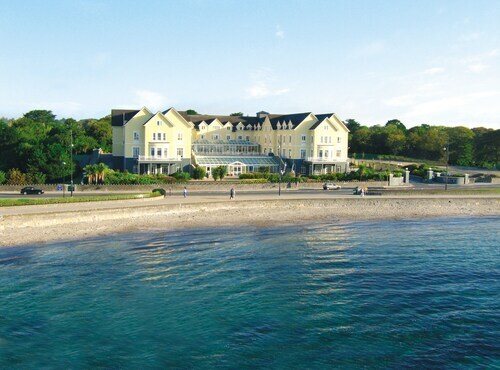 Nestled on the beach, this Galway hotel is within 3 mi (5 km) of Salthill Beaches, University Hospital Galway and Eyre Square. National University of Ireland-Galway is 2 mi (3.3 km) away. 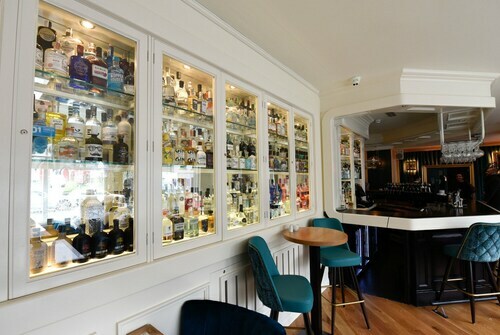 Located in Galway City Centre, this hotel is within 1 mile (2 km) of Galway Shopping Center, Eyre Square and National University of Ireland-Galway. University Hospital Galway is 1.3 mi (2 km) away. Galway Station is 20 minutes by foot. Located in Galway City Centre, this hotel is within 1 mile (2 km) of The Fountain, Eyre Square and National University of Ireland-Galway. University Hospital Galway is 1 mi (1.6 km) away. Galway Station is only a 4-minute walk.